News: New York architect Steven Holl has seen off competition from 104 applicants including Zaha Hadid, OMA and Amanda Levete, to design a new wing for the Mumbai City Museum. 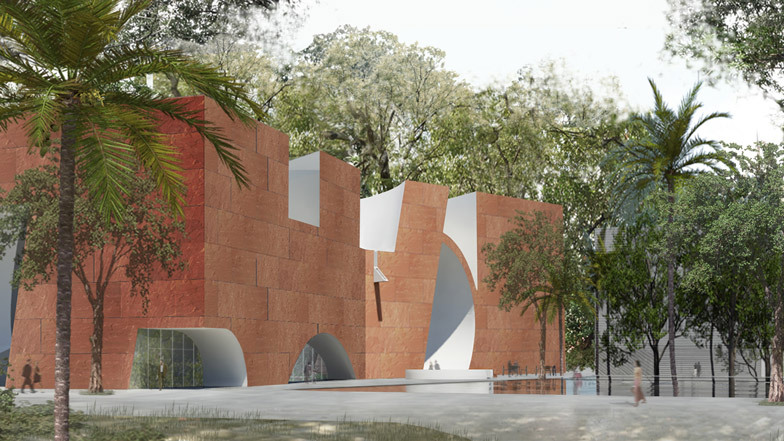 Steven Holl Architects collaborated with Mumbai practice Opolis Architects on the red stone design for the new north wing of Mumbai's oldest museum, the Mumbai City Museum. The Victorian museum sits within a 47-acre botanical garden and zoo in Byculla, to the south of Mumbai. The new wing will extend into the garden and house a permanent gallery and a temporary exhibition space capable of receiving large-scale touring shows. Renderings of the design show a red building with deep cut-outs for windows and openings, and a smooth white interior. Expected to be between 8,000 and 10,000-square-metres, the extension will include a conservation centre, library and archives, and a new museum shop and cafe. The museum said that the international architecture competition was the first to be held for a public building in Mumbai. Prominent entrants among the eight teams shortlisted for the commission were OMA, Zaha Hadid Architects and Amanda Levete's studio AL_A, which designed a new subterranean gallery for London's Victoria and Albert Museum. "It is an incredible honour to be the winners and we're very excited about the next steps on the project," said Noah Yaffe, partner at Steven Holl Architects who also designed the Nelson Atkins Museum of Art in Kansas City, the Herning Museum of Contemporary Art in Denmark and Helsinki's Kiasma Museum of Contemporary Art. Local rough-cut Agra stone will be used for the facade, which features a roof with parapet detailing. The irregular shapes carved from the brickwork will expose accents of the thick white concrete that be used to form the interiors, which feature curved walls and ceilings. "The winning design was distinctive for its sculptural and calligraphic qualities and its commitment to sustainability," said a statement from the museum. "It proposes a simple volume, which is enlivened by deep subtracting cuts, creating dramatic effects of light and shade." One arch cut into the base of the building rises over a pool of water fitted with photovoltaic units that will help to offset the museum's electricity consumption. The pool will be submerged into a garden courtyard between the old and new buildings. Tropical planting is pictured emerging from boxes sunken below the water's surface. Construction is expected to begin in 2015.